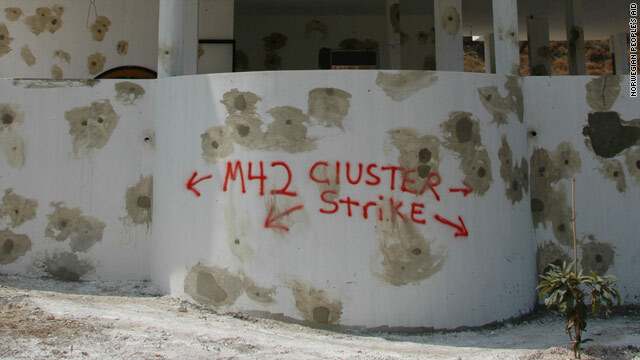 FILE: Words of warning at a house in Lebanon where unexploded submunitions from cluster munitions were found scattered. ICRC describes bombs as a "persistent humanitarian problem"
London, England (CNN) -- A law banning the use, production, and stockpiling of cluster munitions came into effect Thursday in Britain. British Prime Minister Gordon Brown urged other countries to enact similar legislation, saying a global ban is needed to fight such "cruel and indiscriminate weaponry." The Cluster Munitions (Prohibitions) Act received royal assent Thursday after it passed through both houses of Parliament. "Cluster munitions cause immense suffering to civilians caught in conflict zones, and leave a deadly post-conflict legacy for future generations," Brown said in a statement. "I am hugely proud that with this bill receiving royal assent, Britain is leading the world in banning the use of these munitions and moving to end the harm they cause." The act also bans direct financing of cluster munitions production. The British government has already said it plans to work with the financial sector, non-governmental organizations and others on a voluntary code of conduct to prevent indirect financing of the weapons. Cluster munitions, which break apart in flight to scatter hundreds of smaller bomblets, are described by the International Committee of the Red Cross as a "persistent humanitarian problem." Most of a device's bomblets are meant to explode on impact, but many do not. Credible estimates show the weapons fail between 10 percent and 40 percent of the time, leaving civilians at risk of harm from unexploded ordnance, the ICRC says. During the 34-day war in Lebanon in 2006, the United Nations estimated that Israel dropped 4 million bomblets, 1 million of which may not have exploded, according to the ICRC. More than 250 civilians and bomb-disposal operators have been killed or injured by them in southern Lebanon since the war ended. Cluster bombs were also used in the 1999 war in Kosovo. In more than 20 countries, according to the ICRC, cluster bombs have created lasting "no-go" areas, rendering them as dangerous as minefields. Laos is the most affected country, where millions of bomblets dropped during the Vietnam War continue to kill civilians more than three decades later. Britain is among 104 nations that have agreed to a treaty banning all cluster bombs. Thirty of those nations have ratified it, and Brown said he hoped passage of the new law would pave the way to U.K. ratification of the ban. Four of the world's biggest cluster bomb makers -- Russia, China, Israel and the United States -- have not signed the ban, claiming the devices are a vital part of their defense strategy. "We want all other users and producers of these munitions around the world to follow in our footsteps," said Brown. "We want nothing less than a full global ban on cluster munitions, with all countries signing up to the international convention. There can be no place in the international community for cruel and indiscriminate weaponry such as cluster bombs." In addition to calling for a total, immediate ban of the weapons, the treaty calls for strong standards to protect those injured. It urges that contaminated areas be cleaned up quickly and weapons immediately destroyed, the Cluster Munition Coalition has said.